Reports from matches this season go to the fixtures section and click on the report linked to the match you want to read about. Alternatively for earlier seasons go to the fixtures section of the archive for the relevant year. Queens recorded their second win of the season against the side who had been the only losing league guest this term - Airdrie United. The line up saw three changes to last week, Colin Scott restored to goal, Stuart Lovell replacing Brian Reid in the centre of the back four with John O'Neill coming into the midfield and Willie Gibson given a starting role at the expense of Derek Lyle. New signing Andy Aitken got a place on the bench in his first match back. Queens started the game at a ferocious pace with the look of a side who were determined to collect all three points. 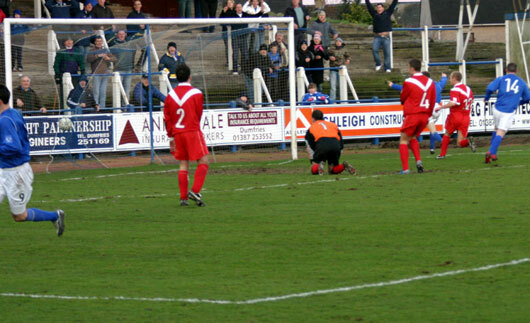 Within the first minute Graham Weir almost opened the scoring as he was played clean through on goal but failed to beat Robertson in the visitors goal. Queens kept pressing and with nine minutes gone Graham Weir was put through on goal from an excellent Andy Thomson flick and this time Robertson could do no more than haul the striker down to receive a yellow card and concede the penalty. The ever reliable penalty taker John O'Neill made sure that he was first to the ball and smashed it into the back of the net with some conviction. It was all Queens at this point and Andy Thomson showed some great skill to pull a ball down on the edge of the box, turn and strike it goalward, unfortunately his effort drifted just wide of the post. Graham Wier then had a free header from a corner but luckily for Robertson in the Airdrie goal he was in the right place at the right time and held the effort comfortably. 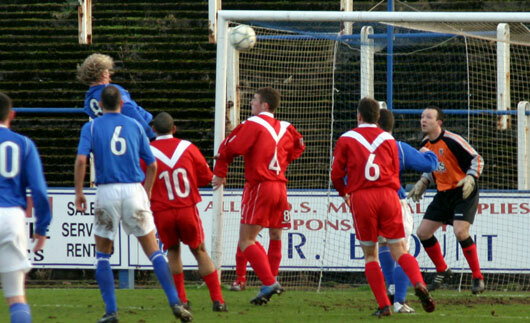 The balance of play was shifting however and Airdrie United were looking a much more threatening side. Brian McPhee managed to work himself clean through on goal and with Colin Scott spreading himself at the veteran strikers feet the keeper made a great stop. McPhee though wasn't done and he collected the saved ball and shot again, this time beating Scott but not Stuart Lovell who made a great stop on the line just at the post. The final action of the half saw a superb Willie Gibson early ball deep into the Airdrie goalmouth and met full on by the in rushing Eric Paton - it was a certain goal - except that somehow from what looked like two yards Eric managed to screw the ball wide of the far post. The second half was pretty much one way traffic but not in Queens favour as Airdrie desperately tried to rescue something from the match. Ian McCall replaced Ryan McStay with Steve Bowey to stiffen things up in the middle of the park and put on the fresh legs of Michael Mullen in place of the industrious and effective Graham Weir. Airdrie came close on a number of occasions as a lot of the match was played inside the Queens penalty area, one notable chance was an overhead effort that looped over the bar. Queens wrapped things up in a breakaway move in the seventy fifth minute as Andy Thomson brought down a high ball on the edge of the box before turning and firing it towards the far corner of the goal. Robertson made a good finger tip save to push the ball away but Paul Burns was following up and slammed the ball into the back of the net from a tight angle to make it 2-0. 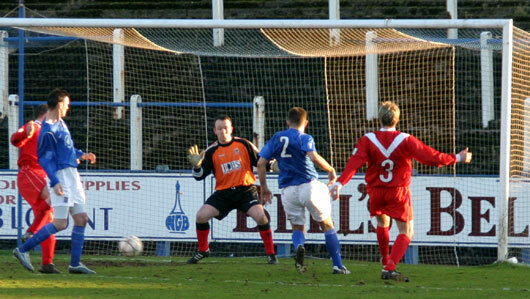 The final change saw Andy Aitken come on for Andy Thomson as Ian McCall went for consolidation. Airdrie played the final few minutes with just ten men after using all of their substitutes and losing Stephen McKenna after a nasty clash in the middle of the park. Both goals from David Gow on the terraces. Queens deserved their win for their first half attacking play and movement and their second half defensive performance. The new players are gelling well together and with both Stranraer and Brechin losing today things are looking up.